You are invited to celebrate Easter Sunday this year at one of Tampa Bay’s Best Brunch restaurants. If you like a quiet refinery or an afternoon outdoors soaking up spring with mimosas and short rib benedict, you are sure to find the perfect place for Easter brunch on this list of best Easter brunch restaurants in Tampa Bay. We recommend making plans now, as it's time to make reservations! Leave the preparation and the dishes to someone else this Easter Sunday, simply choose one of these fine restaurants, pick up the phone, make your reservations and you are done! Come Easter Sunday, dress in your Easter best and prepare to be delighted by the finest foods, drinks, and fun the area has to offer! You can't go wrong with any of the choices we curated for Easter 2019! Channelside favorite appreciated for its relaxed waterside views on Tampa Riverwalk. Tampa's Marriott Hotel Waterside Grill will offer a few Easter Brunch specials taking inspiration from the season with several ingredients grown in their own rooftop garden. Watch the Hillsborough River glide by as you dine then take a stroll through Cotanchobee Fort Brooke Park or to the Tampa Bay History Center on the Riverwalk after what while be an unforgettable Easter Brunch. A special children’s menu is also offered. Hop aboard the Pirate Water Taxi to cruise the river after lunch. Call 813-204-6313 or reserve online via OpenTable. Maggiano's Little Italy, located in Westshore Plaza, is offering brunch specials for this entire month! The menu includes several options for entrees, soups, and desserts. If you're a big fan of dessert, you'll love their carrot cakes pancakes! This offer is available now through May 1. Check out their menu and make a reservation! One of Tampa's premier seafood restaurants located across from in International Plaza and Bay Street 11 am to 2 pm. Prix fixe menu featuring three courses filled with a great selection of five-star dining options, including $9 mimosas! A special children’s menu is also offered. Choose from a three-course meal or one of your favorites from Eddie's classic dinner menu. Adults $49, Children $15 for brunch, regular prices when dining from the dinner or children's menu. Sail the sparkling waters of Tampa Bay on this elegant cruiser 10:30 am - 8 pm. This Easter hop on board Yacht StarShip for a family-friendly Easter Brunch or dinner cruise with an elegant touch! The unforgettable Easter buffet will be filled with both classic and seasonal dishes spanning a wide assortment of cuisines. Join the yacht's award-winning chef on a two-hour cruise (departure times vary), and dine while taking in the sights of Tampa Bay’s or Clearwater Beach’s beautiful waterfront. Relax on the deck at the cash bar, or enjoy a robust coffee and tea service while on board! Dance as the DJ spins your requests and enjoy a special visit from the Easter Bunny as you cruise this Easter! This Best Easter Brunch Cruise Boards in Tampa at 10:30 AM Departs at 11:00 AM Returns: 1:00 PM Late Cruise Time Boards at 2:00 PM Departs: 2:30 PM Returns: 4:30 PM Prices: Adult: $49.95 Child: $39.95 plus a $2 marine fee and tax. Check the website for Clearwater times and Easter dinner cruise options by clicking here. Make plans to spend Easter Sunday with Chef Brian and the Bizou crew as they assemble a brunch to remember in the historic old Federal Courthouse in Downtown Tampa. Chef and his team will be dishing up your favorite salads, breakfast items, omelets, meats, deserts, and baked goods like their delish Classic Caesar, Apple and Blueberry Maple-Crusted Belgian Waffles, and their sundried tomato and spinach frittata with smoked cheddar cheese. You can also dine on omelets or freshly carved brown sugar and honey smoked ham, and assorted freshly baked cakes, pies, and cookies. Bizou Brasserie's Easter brunch buffet is priced at $45 for adults, $22 for children ages 5-10, and children under 4 are free. Call to reserve your place at (813)227-9555 or book online at OpenTable. Nestled in lovely Hyde Park, Timpano's is classy, sophisticated, and perfect for an intimate Easter Brunch at 11 am -3 pm! Enjoy an Italian-inspired special brunch menu, featuring delicate frittata, ricotta pancakes, filet benedict, fire-roasted meatballs, pasta Bolognese, and so much more. Accompanied by one of Timpano's famous Garlic & Basil Bloody Mary, this brunch experience is not to be missed! For reservations, visit their website or call 813-254-5870. A seasonal Italian restaurant with a southern soul twist serving up brunch from 11 am - 4 pm to the Tampa Bay community. Since 2014 Noble Crust has made a name for itself as one of the best brunch places in St. Petersburg since expanding to Carrollwood and Westley Chapel. 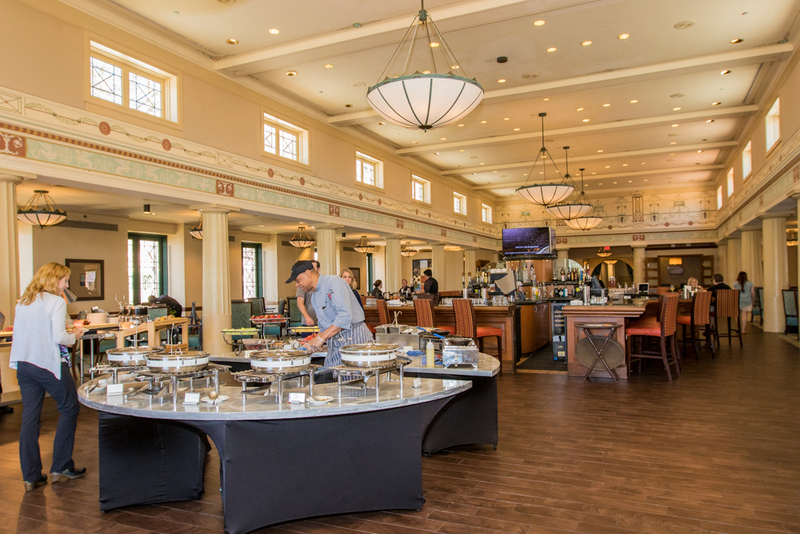 They are not offering a special Easter Brunch menu, but encouraging those to come in and enjoy their full-flavored menu including lemon ricotta pancakes, bottomless mimosas, hand-crafted pizzas, Short rib benedict, and fried chicken and waffles. Brunch is offered Saturdays and Sundays at all 3 locations throughout Tampa Bay. Call your local restaurant for reservations or book online today! Enjoy Easter brunch from 9:30 am - 4 pm with family and friends at the best waterfront view in Tampa Bay. Overlooking Tampa Bay, the Rusty Pelican will be offering not only stunning views but a Champagne Easter Buffet from 9:30 am till 4 pm. The Buffet will include a raw bar, bottomless mimosas, a Bloody Mary bar, honey glazed salmon, applewood smoked prime rib, and more. Enjoy some family fun on the water with decadent food and fun activities like a photo booth. An Advanced deposit is required to secure reservations, prices are $75 for adults, $35 for children, and children 5 and under eat free. Call (813)281-1943 to reserves a table today or book online through OpenTable. Nested in Centro Ybor, GameTime offers brunch along with fun and games for all ages from 10 am - 3 pm on Easter. Come with the whole family and enjoy Easter brunch fun with Sonic the Hedgehog in Ybor City. Easter brunch will be from 10 am- 3 pm, Buffet will be $16.99 per adult and $9.99 per child under 12 years old. Sonic appearances are at the top of every hour for 30 minutes each session. GameTime offers loads of fun for the entire family. Call today for reservations! After brunch, you can explore all of the great things Ybor City has to offer. A pirate-themed restaurant serving Tampa Bay’s iconic “Booze Cruize Brunch” at 11 am and 1:30 pm every weekend in Ybor City. Every Sunday Gaspar’s Grotto has the most iconic brunch “Booze Cruize Brunch” in Ybor City’s Historic District. Gaspar’s Grotto is Tampa’s world-renowned Pirate Bar and Restaurant offering a 50 feet buffet of food including a carving station, raw bar, omelet station, hot dishes, desserts, and more. For those of age, you can enjoy free champagne and mimosas all morning and an additional 3oz craft of vodka for the Bloody Mary Bar. There are two brunch seating’s every Sunday from 11 am- 1 pm and 1:30 pm – 3:30 pm. Adults are $42.95, kids age 10 and under are $17.95, and kids under 5 are free. Reservations are not required but encouraged. Located in Westshore Plaza Seasons 52 is grilling up fresh and season food for Easter brunch. Join Seasons 52 for the feel-good 3-course Easter brunch from 10 am- 2 pm for $29.95 on Easter Sunday. Want to make it boozy? For an additional $14.95 you can sip endless Mimosas, Bloody Mary’s, Sangria, or Champagne Bellini. Join Seasons 52, located in Westshore mall, for some French toast with spiced bacon and fresh blueberry compote, grilled sea scallops, or decedent steak and eggs. Check out the full menu for Seasons 52 Easter Brunch. A high-end steak house serving up an unforgettable Easter Brunch starting at 10 am. Opening early at 10 am for an unforgettable 3-course Easter Brunch starting at $30 per person with house favorites like brioche French toast and steak and eggs. Fleming’s will also offer their full dinner menu, a 3-course Filet and Lobster menu starting a $50 per person, and a special 3-course children’s brunch menu for Easter Sunday. Located in International Plaza and Bay Street, The Capital Grille will be serving Easter brunch starting at 10 am. The Capital Grille is a world known steakhouse offering a 3-course brunch menu starting at 10 am on Easter Sunday. Brunch starts at $49 per person and offers choices such as soup or salad to start, jumbo shrimp and grits, lobster frittata, filet mignon, and chicken and waffles. The Capital Grille will also offer a $15 per person children’s brunch menu. Make your reservation soon! This place fills up every year. Offering the most authentic Churrascaria in Florida! Terra Gaucha welcomes you to join them Easter Sunday for an unforgettable meal. Terra Gaucha Brazilian Steakhouse offers fire-roasted meats, gourmet sides and salad bar, and decadent desserts with impeccable service for lunch or dinner 7 days a week. Easter Sunday lunch will be served from 11:30 am -3 pm and dinner from 4 pm - 9 pm, both offering the full Rodizio experience, salad bar and sides, and seafood options. Check out the full menu prices and even book your table today online! Don’t forget to mention Easter Egg when booking your reservation to receive a special certificate. The newest hang out in Hyde Park offering authentic bites and cocktails. Starting at 10 am Thee Tree House welcomes you to join them Easter Sunday to enjoy their rich and fresh brunch menu and try some CBD brunch cocktails. Thee Tree House prides themselves on the fact that everything is scratch made and it really shows. Items include chicken and waffles, savory waffle gravlax, biscuits and gravy, and the tree house biscuit sandwich. Offering gluten-free, vegan, vegetarian, and keto friendly options Thee Tree House has something for everyone. Make your reservation today on OpenTable. Every Sunday WTR is hosting the largest and only Vegas-style pool party in the Tampa Bay area. Starting at 11 am get ready for some Sunday fun day this Easter at WTR Pool Party. This is an exclusive 21 plus event, offering free coverage to ladies on the guest list before 1 pm, music by DJ Camo, and a breakfast buffet or bites from the grill all day. The cover is $10 for females and $20 for males. You can reserve VIP tables, cabanas, and daybeds online at a great price. Make your reservation today! Hope you’ve found your Easter brunch spot in Tampa Bay! Check out more restaurants and Easter things to do in Tampa Bay by visiting 813 area.